12.3 "Put the middle class first"
John Yarmuth is a Democratic member of the United States House of Representatives, representing the 3rd district of Kentucky. Born and raised in Louisville, Kentucky, Congressman Yarmuth graduated from Atherton High School where he served as student government president. He went on to earn a degree in American Studies from Yale University. He and his wife Cathy have one son, Aaron, who graduated from Indiana University in 2006 and obtained a Masters Degree from American University in 2010. Yarmuth previously worked on Capitol Hill as Legislative Aide for Kentucky Senator Marlow Cook from 1971 to 1974, before moving back to Louisville, to publish Louisville Today Magazine. He went on to work as Associate Vice President of University Relations at the University of Louisville and Vice President of a local healthcare firm. In 1990, Yarmuth founded LEO Weekly, a free publication with approximately 150,000 monthly readers. With Yarmuth as editor, LEO won nearly 100 Metro Louisville Journalism Awards, 16 of which were awarded to Yarmuth for his editorial and column writing. He owned the paper from 1990 to 2003, and continued writing his columns through 2005. On television he debated local and national politics as co-host and commentator on WAVE 3’s "Yarmuth & Ziegler" in 2003 and “Hot Button” in 2004 and 2005. Brat Magazine was a youth-run zine in the 90's that offered a critical youth perspective on politics and culture. Starting with a 500 copy press run and ending with a distribution of 10,000 copies per issue, it became a nationally prominent political zine. In its later years, staff members became the go-to resource for the local media when seeking youth opinion. The magazine began in 1995 when 19-year-old Liz Palmer, a journalism student, attended a community meeting at Twice Told Coffee, hosted by the Highlands Business Association and Alderman Tom Owen. The meeting was called in response to Bardstown Road business owners who complained, as a coinciding LEO Weekly article headline suggested, that "youth were ruining the Highlands." Seeking to provide a balance of opinion at the public meeting, Liz spoke against anti-youth policies, suggesting that the city invest in the youth instead and recognize the value of the youth cultural influence in the district. In the following months, Liz connected with Mike Harpring, Nathan Tobin, Corey Lyons, and other youth in the area and launched the first issue of Brat, a tongue-in-cheek "reclamation" of the word, in 1996. Supported entirely by local advertisers, Brat shifted from a local zine to a national magazine with mail-order distribution and independent bookstore distribution in a dozen states in the midwest and east coast. It was given starred mentions in zine review publications like Factsheet Five. Coinciding with the rise of Brat was a local and nationwide shift to implement dress codes, city curfews, and skateboarding bans. Brat staff members rallied the youth of the city to these causes through protests and rallies, including hosting a First Amendment Rally in downtown Louisville. The zine attracted more staff members to youth causes and related issues. Other actions included a Fairness Ordinance civil disobedience action that resulted in the arrest of two members who refused to move from Sixth Street outside of City Hall. Among other actions, members participated in public awareness campaigns with Anti-Racist Action Louisville, and took part in a national protest against the World Trade Organization in Washington, D.C. On numerous occasions, local civil rights leader and Committees of Correspondence activist Anne Braden and other members of the Braden Center worked with the group on issues relating to youth, race, gender, and sexism. As the zine raised its profile, the local and national media took interest. A number of publications wrote about Brat or interviewed its members, including NPR's All Things Considered, Utne Reader, the Courier-Journal, Louisville Magazine, and LEO Weekly. Staff members appeared as guests on future U.S Representative John Yarmuth's local talk show. Ira Grupper, Vice-Pres. (a Committees of Correspondence leader). On Saturday morning, June 10, 2006, an estimated 140 people joined elected representatives, public health officials, and health care providers at Calvary Episcopal Church in downtown Louisville to hear the testimonials of individuals who understand the real costs of our national health care "meltdown." The two-hour event, billed as a "Citizens' Congressional Hearing on the Health Care Crisis," was sponsored by Kay Tillow's Kentuckians for Single Payer Health Care and the Kentucky Chapter of the socialist led Physicians for a National Health Program . Co-sponsors included 33 labor and social justice organizations including several Committees of Correspondence controlled or influenced organizations such as the Coalition for the People's Agenda, Fairness Campaign, Kentuckians for the Commonwealth, and Kentucky Alliance Against Racist and Political Repression. The featured speaker, Dr. Ewell Scott, an internist from Morehead, KY and also a Physicians for a National Health Program outlined "the single payer solution." He explained how a national nonprofit health insurance system would work,and why attempts at short-term fixes will not. Two other PNHP members Dr. Edgar Lopez, and Dr. Garrett Adams, also spoke. Candidate John Yarmuth urged voters to boldly confront candidates on health care, to track campaign donations from the health care industry, and to vote for those who support a national single payer system. Facing an incumbent well-funded by the for-profit health care sector, he acknowledged that it is not easy "to discuss a complex issue like health care reform in sound bites." Mr. Yarmuth is, however, encouraged by the fact that "on this issue, I believe the people are out in front of the politicians." Don't worry--we'll be back in Frankfort for the next session," said Kentuckians for Single Payer Health Care Coordinator Kay Tillow, issuing an urgent call for grassroots action. Ms. Tillow has been successful in gaining endorsements for HR676 from labor organizations around the country. Circa 2006, Code Pink's Trudi Kubick and Louisville Media Reform Group activists John Wilborn (a Committees of Correspondence member, John Hicks, Victoria Strange and Mark McKinley recently met with KY 3rd Congressional District Representative John Yarmuth at his local office to advocate for the preservation of net neutrality. Our friends at Free Press scheduled the visit as part of the full court press to keep the internet free. Representative Yarmuth said he supports equal access to the internet but expressed questions about ISPs funding capacity upgrades without tollbooths. Don't let John get snookered by telco kool-aid. A team of researchers at the University of Florida's Warrington College of Business Administration concluded in their report:"...the INCENTIVE to upgrade capacity is HIGHER under net neutrality." Contact John - tell him to "just say NO!" to Big Media spin. Press John to talk with Rep. Ed Markey, and to support Markey's efforts to preserve net neutrality. At the time, prominent Louisville Media Reform Group activists included Cherise Williams, Anita Solomon, and Committees of Correspondence for Democracy and Socialism members Ira Grupper, and Walter Tillow. LEO Founder and Democratic Rep. John Yarmuth, KY-3, announced Jan. 4, 2008 that he’s donating his salary to 38 local organizations "that can probably use it more than the independently wealthy first-time Congressman can". Yarmuth pledged in 2006, during his race against former Rep. Anne Northup, to donate all $120,000 to charity. Two of the groups he pledged to were connected to the Committees of Correspondence for Democracy and Socialism, including the Kentucky Alliance Against Racist and Political Repression, and the Fairness Campaign. In 2012 Yarmuth donated his salary to several local causes, including the CCDS connected Anne Braden Institute for Social Justice Research. Kentuckians for the Commonwealth's I Love Mountains Day 2009 saw another strong turnout in Frankfort as hundreds marched and rallied in support of clean water and protections for Kentucky's mountains and coalfield communities. The crowd marched about a half mile to join a another crowd waiting for them on the front steps of the state capitol, greeted by music from Ben Sollee and David Martin Moore. Speeches by Sen. Kathy Stein, Rep. John Yarmuth, Committees of Correspondence supporter K. A. Owens, Randy Wilson, Silas House, Ashley Judd, Lyle Snider, Willa Hood, Emily Gillespie and Teri Blanton. May 30, 2009 Congressman John Yarmuth co-sponsor of HR 676, single payer healthcare, introduced Congressman John Conyers , at a New Albany, IN/Louisville, KY single payer event with, Dr. Claudia Fegan, Dr. Rob Stone, chaired by The Rev. A. David Bos, at IUS. Over 150 people attended. This is one of the 10 national single payer seminars supported by the Presbyterian Church USA. The event was sponsored by Kay Tillow's Kentuckians for Single Payer Healthcare, Hoosiers for a Commonsense Health Plan, and Physicians for a National Health Program-KY.
A panel was convened to discuss the issue of health care reform. The panelists included Rep. John Yarmuth, Dr. Garrett Adams of Physicians for a National Health Program, Kay Tillow of Kentuckians for Single Payer Health Care, Rick Mitchum, CEO of Prepared Health Plan Inc., and Vickie Yates Brown, attorney and co-author of Health Care Reform in Kentucky. Kay Tillow urged continued support for Congressman John Conyers bill, H.R. 676. HR 676, also called the “U.S. National Health Insurance Act,” is a bill to create a single-payer, publicly funded, privately delivered universal health are program. Kay urges community support of HR 676. Rep. John Yarmuth has signed on to the bill prior to passage of President Obama’s health care reform law. Oct. 26, 2011 Rep. John Yarmuth rose in the House to praise the Fairness Campaign. Mr. YARMUTH. Mr. Speaker, I rise today to honor Louisville's Fairness Campaign--Kentucky's oldest lesbian, gay, bisexual, and transgender civil rights organization. This month the Fairness Campaign is celebrating 20 years of fighting against discrimination, inspiring hope, and protecting our citizens. Thanks to Fairness, in 1999 Louisville became one of the first cities to prohibit housing and employment discrimination on the basis of sexual orientation and gender identity. Now Fairness is working tirelessly to secure these protections for all Kentuckians. Because of Fairness, more Kentuckians are seeing that the lines once drawn between us because of sexual orientation and gender identity are only imaginary, and they're realizing that hate has no place in our Commonwealth. That's a message that needs to be heard not just from Pikeville to Paducah, but from coast to coast. I urge my colleagues to join me in congratulating the Fairness Campaign on two decades of service. It's truly thrilling how much progress they have made. I would also like to individually honor the 10 brave Louisvillians who co-founded the Fairness Campaign in 1991 to seek equal protections for all citizens under the law: Jim Adams, Eric Graninger, Lisa Gunterman, Ken Herndon, Jane Hope, Pam McMichael, Susan Remmers, Jeff Rodgers, Thom Snyder, and Carla Wallace. In 2013 Progressive Democrats of America assigned activists to deliver their material to every US Congressman. Kay Tillow, who has ties to both the Communist Party USA and the Committees of Correspondence for Democracy and Socialism, was assigned as the contact for Kentucky Rep. John Yarmuth. In June 2013, the PDA contact was Colleen Clemons. High school juniors who win the 2014 University of Louisville Yarmuth Book Award will be given UofL associate professor Catherine Fosl’s book about Kentucky civil rights activist Anne Braden, a member of the Communist Party USA who went on to join the Committees of Correspondence for Democracy and Socialism in later life. The book, “Subversive Southerner: Anne Braden and the Struggle for Racial Justice in the Cold War South” (Palgrave Macmillen, 2002), is the biography of Kentucky native Braden, a southern white woman who in the late 1940s rejected her segregationist and privileged past to become a lifelong crusader against racial discrimination. Fosl is an associate professor of women’s and gender studies and director of the Anne Braden Institute for Social Justice Research at UofL. The award began in 1987, and funding is provided by an endowment from the family of U.S. Rep. John Yarmuth in honor of his father, Stanley Yarmuth. In 2007 Louisville, Rep. John Yarmuth spoke at the event which was cosponsored by a new organization called the Louisville Climate Action Network (LCAN) that hosted Louisvlle’s participation in Step It Up 2007. The Council for a Livable World, founded in 1962 by long-time socialist activist and alleged Soviet agent, Leo Szilard, is a non-profit advocacy organization that seeks to "reduce the danger of nuclear weapons and increase national security", primarily through supporting progressive, congressional candidates who support their policies. The Council supported John Yarmuth in his successful 2008 House of Representatives run as candidate for Kentucky. He has also been previously supported by the Council. The Populist Caucus was founded on February 11, 2009 in the United States House of Representatives by Democrat Bruce Braley of Iowa. The caucus originally included 26 other Democrats in the House, including John Yarmuth. In 2008 Yarmuth was endorsed by JStreet PAC. Yarmuth has been a consistent and outspoken advocate for bold US leadership to broker a two-state solution. JStreetPAC is proud to re-endorse Yarmuth, a five-time endorsee. On Jan. 27, 2010, U.S. Representatives Keith Ellison and Jim McDermott led 52 other members of Congress in signing a letter addressed to President Barack Obama, calling for him to use diplomatic pressure to resolve the blockade affecting Gaza. John Yarmuth was one of the signatories of the letter. The entire letter together with a complete list of signatories can be read by clicking here. There were also some outright victories for peace candidates. In Kentuckys Third Congressional District centered in Louisville, John Yarmuth won a three-way primary. He calls for withdrawal from Iraq and for taxing the rich. Though HR 2, "Repealing the Job-Killing Health Care Law" passed in the House of Representatives on January 19, Rep. John Yarmuth, D-Ky., voted against the repeal, voicing the opinion of the Kentucky working class against the corporate interests of the Republican Party. Yarmuth, who represents Louisville and the surrounding area, stood by his earlier vote for the historic health care law passed by the 111th Congress last March. In December, Yarmuth voted for the pro-worker Mine Safety Act, which did not pass the House, but would have put more responsibility on mine owners to protect their workers. He also voted to extend unemployment benefits for workers devastated by the recession, voted for the repeal of "Don't Ask, Don't Tell," voted for the DREAM Act, and in August voted for a failed resolution directing the president to removed armed forces from Pakistan. John Yarmuth is very close to Kentucky Jobs with Justice. Metro Louisville Councilwoman Attica Scott’s proposed ordinance to raise the minimum wage in Jefferson County received its first committee hearing Sept. 2014, bringing with it a fuller debate from its supporters and opponents. The same day, Kentucky Jobs with Justice hosted a discussion of the minimum wage at Old Louisville coffee shop Smokey’s Bean, Lunch and Learn, featuring Scott and U.S. Rep. John Yarmuth, D-3rd. Citing gridlock in Congress and Frankfort stalling legislation to raise the minimum wage to $10.10 an hour, Yarmuth argued the best option left to immediately help workers making a sub-living wage in Louisville is action at the council level. Responding to skepticism from some council members — including Democrats — that paying more than $7.25 an hour will hurt businesses, Yarmuth said taxpayers already are subsidizing low-wage businesses because workers must rely on government assistance to survive. “If your business model requires you to pay people less than a living wage, then you shouldn’t be in business,” said Yarmuth. "Put the middle class first"
Just back from a trip to Cuba, in March 2011, U.S. Rep. John Yarmuth said that it's time for the United States to normalize relations with its island neighbor. "Nobody is winning from our policy there," the 3rd District Democrat said in an interview. "We aren't winning and they aren't winning. There's no question it's time to normalize relations." Yarmuth and Democratic Reps. Steve Cohen of Tennessee and Donna Edwards of Maryland spent four days in Cuba. They met in Havana and other cities with government leaders, U.S. officials, scholars, economists, foreign diplomats, physicians,artists, farmers and journalists. The trip was sponsored by the Center for Democracy in the Americas, whose goal is to open Cuba and improve U.S. relations with that nation and others in Latin America. 0n March 23rd, Steve Cohen, John Yarmuth, Donna Edwards, and Sarah Stephens of Center for Democracy in the Americas, met with Reuters, and Financial Times journalist Marc Frank - former writer for the Communist Party USA's People's Daily World, and a propagandist for the Castro regime. Signatories included Rep. John Yarmuth. 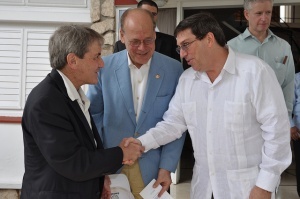 Rep. John Yarmuth attended the Center for Democracy in the Americas' 8th Anniversary Event, June 19, 2014. The Alliance for Retired Americans Political Action Fund endorsed John Yarmuth in 2014, also 2012. In March 2016, John Yarmuth was listed as a new member of the Congressional Progressive Caucus. With Michael Gasser, Medical Student, Mallika Sabharwal, President of U of L Students for a National Health Program, Rina Perlin, Medical Student at Congressman John Yarmuth's Office. A group of six Democratic House members introduced articles of impeachment against President Donald Trump Wednesday November 15, 2017, claiming the president has violated federal law, the public trust and should be charged with high crimes and misdemeanors. From August 2016 – December 2016, Hayden Flanery served as an intern Office of Congressman John Yarmuth (D-KY): Draft formal correspondence to constituents, advise the Congressman on select legislative issues, and prepare reports for legislative assistants on policy. In August 2018 Medicare For All Congressional Caucus founding members included Representative John Yarmuth.